Our wolf carved front door with hand forged wolf door pulls is just one of the many custom, themed door designs that our master artists can create for you entrance. Our custom doors are handcrafted in America from the highest quality wood and all natural materials. Our exterior wood doors are custom crafted for each client by our talented master level wood workers, to fine art quality standards, at ArtFactory.com. Order your dream door custom designed for your residential or commercial property, and make a first impression that reflects your personality and accomplishments. 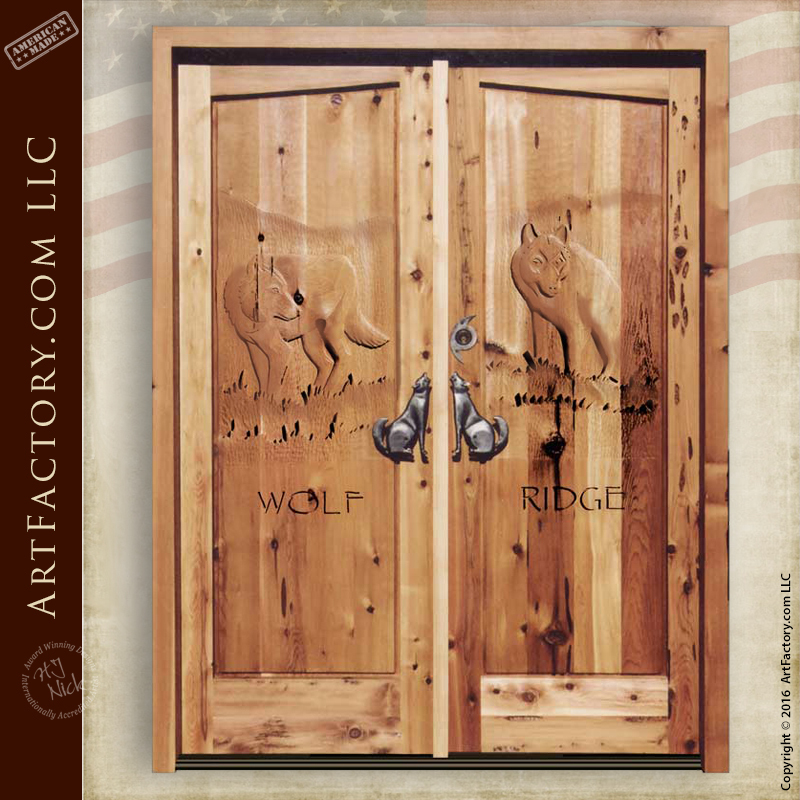 ArtFactory.com offers only the finest signature artistic doors and entrances, individually created by our expert craftsmen, wood carvers, and metal smiths; with no limitations on size, design, thickness or finish. We hand make interior and exterior doors in any style, size, and finish limited only by your imagination. Contact us to discuss your designer door ideas at 1-800-292-0008. This is a thick, solid wood exterior door that is hewn with mortise and tenon construction. We build all of our doors with full length, air dried timber. It has been hand carved by one of our master wood carvers to create this beautiful design. This wolf carved front door includes our custom howling wolf door pulls. These custom pulls and all of our door hardware is hand built master blacksmiths using hammer and anvil over a coal fired forge. All pre-hung exterior door with all weather package include a structural jamb that is 3 inches thick with a 1 inch rabbeted stop. All custom doors includes adjustable heavy duty crush proof threshold, self-closing adjustable tension hinges, automatic mechanical door sweep, single cylinder deadbolt, and roller style door latches.